Welcome to the first Bodacious Blurb in the Bodacious Blurbs Bonanza. Come back every Wednesday to discover more books for your summer reading pleasure! Author Pat McDermott has generously offered a copy of the e-book to the winner of a random drawing. Please comment to enter your name in the contest. Winner selected on Friday at 9 p.m EDST. In the modern Kingdom of Ireland, few mortals believe in the fairy folk. Without that belief, the fairies are dying. Finvarra, the King of the Fairies, would rather dance than worry—but he must have a mortal dancing partner. When Janet Gleason’s grandfather becomes the new U.S. Ambassador to Ireland, the sixteen-year-old orphan must leave Boston and her friends behind. Janet is lonely in Dublin and unused to her grandparents’ stuffy social life. An invitation to a royal ball terrifies her. She can’t even waltz and dreads embarrassment. Finvarra’s fairy witch overhears her fervent wish to learn to dance. Seventeen-year-old Prince Liam Boru loathes the idea of escorting another spoiled American girl to a ball. In fact, he detests most of his royal duties. He dresses down to move through Dublin unnoticed and finds himself on his royal backside when Janet crashes into him. Intrigued, he asks to see her again, and she willingly agrees. Unaware of each other’s identities, they arrange to meet. When they do, the fairies steal Janet away. Liam’s attempts to find her trigger a series of frustrating misadventures. Can he and Janet outwit a treacherous fairy king who’s been hoodwinking mortals for centuries? Catch me on Thursday afternoon, July 12 on the Muse It Up Publishing Blog...Let me know what frightens you! 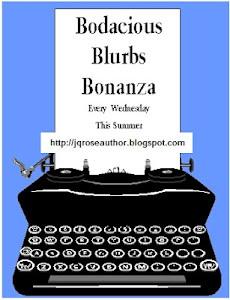 JQ, the fairies and I are delighted to help kick off your wonderful Bodacious Blurb Bonanza. It's a great idea! So this takes place in Ireland and a wonderful place for this type of premise. Sounds like a fun read and is on my TBB list which keeps growing. Good luck with the sales. I see a winner here. Great review. I actually read this yesterday but I've got company and everyone else took turns on my computer. But--I did go through the entire day saying, Bodacious! Hi, J Q! Thanks for sharing about this book. I had heard about it, but never read a blurb for it. I've added it to my TBR book list. Thanks everyone for stopping in to help kick off the BBB! Yes, this story does sound like it should be on the TBR list! It's late, but I just had to comment to say what a fun post to start your BBB, JQ! You're never too late, Conda. Thanks for stopping in! Congratulations to the winner of the drawing!! 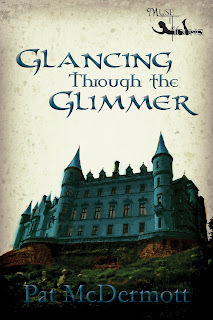 Susanne Drazic...Pat will send you the copy of Glancing through the Glimmer.